If the rest of the Palm Springs revitalization goes as well as the Kimpton Rowan, the city’s guaranteed a stellar comeback. Pros: It’s a gorgeous property with stunning views and great amenities. Cons: The Wi-Fi was sluggish. Once the hottest place to be — figuratively and literally — for Hollywood stars like Frank Sinatra, Bob Hope and Doris Day, the hype around Palm Springs, CA, has quieted down over the years as tourism moved east to Rancho Mirage and Palm Desert. The city is working to change that, however, through its $400 million downtown revitalization project, which is now nearing completion. The anchor to that project is the Kimpton Rowan Palm Springs Hotel, which opened on Nov. 17 as the first ground-up, full-scale hotel built in the area in decades. At seven stories, the 153-room hotel is now the tallest building in the city and the only one to offer a rooftop pool. Naturally, we checked it out. When I checked prices recently, base rooms with either one king bed or two queen beds started at $254 per night, and went as high as $768 per night during Coachella. Alternatively, now that it’s possible to redeem IHG Rewards points for stays at Kimpton properties, you could spend between 45,000 plus only $104 to 60,000 points outright for an award stay. The lowest nightly rate I found for the presidential suite was $1,240. Regardless of the method you use to book the stay, there’s a mandatory resort fee of $40.84 per night (annoying but common for Palm Springs). In this case, the fee includes valet parking, pool access, internet access, fitness-center access and use of the hotel’s bikes. The new Kimpton property was right in the heart of downtown Palm Springs. At the hotel’s doorstep was Palm Canyon Drive, home to the city’s best restaurants, stores and galleries. As part of the revitalization project, the strip welcomed many new tenants such as H&M, MAC Cosmetics and Starbucks Reserve. Free People, Francesca’s and Tommy Bahama, among others, were to open soon while I was there. Every Thursday night, the street closes for vehicular traffic and transforms into VillageFest — a lively street fair showcasing artists, artisans, entertainers and purveyors of fresh produce, flowers, jewelry, snacks and sweets. The entrance incorporated a design that suited the arid climate and mid-century roots of the locale perfectly. That being said, the interior was where the hotel really shone. Upon walking in the front door, I was immediately struck by the lobby’s high ceiling and sleek design. As you’d expect from a Kimpton property, the main lobby was stylishly furnished, and there was plenty of locally inspired décor, but with a contemporary slant. A two-story window illuminated the lobby with plenty of natural light and provided a picturesque view of the San Jacinto Mountains. I felt like I’d stepped inside the latest issue of Architectural Digest. Behind the reception desk was a 16-foot tall macramé owl — another way the hotel paid homage to Palm Springs’ mid-century heritage. Standard rooms were available with either one king bed or two queen beds. As with the rest of the hotel, the rooms were tastefully decorated and maintained locally inspired design elements. The king room came with a full-length window in the shower that looked right into the bedroom, though there was also a shade that could be pulled down for privacy. One of the amenities I value most in hotel rooms is easily accessible power outlets, and the designers of this room didn’t overlook this feature. The bedside tables each had two USB plugs and two actual outlets. The desk was clutter-free and had built-in power outlets. Below the TV was a minibar stocked with snacks, beverages and travel accessories. There was no in-room coffeemaker or kettle, but the hotel offered complimentary coffee and tea in the lobby. The bathroom was bright and modern. It had just one vanity, but that meant the counter was clear for guests’ personal belongings. To the left of the vanity was a walk-in shower, which looked like it would just barely pass the TPG shower test (Brian’s 6 feet, 7 inches) — and to the right was a separate toilet stall. Toiletries were in large, refillable bottles, and were from Atelier Bloem, Kimpton’s exclusive bath-and-body line by Malin + Goetz. As is standard with Kimpton hotels, a wide selection of complimentary travel amenities also were readily available. Opposite the bathroom was the closet. Besides the usual bathrobes and safe, it had a yoga mat and a signature “closet smile” item. (Each Kimpton property tries to incorporate a quirky local touch into its closets that will make guests smile when they see it.) In this case, it was a green camel, because the city has an archaic law against riding a camel down Palm Canyon Drive between the hours of 4:00pm and 6:00pm. The room I stayed in wish I’d stayed in was called The Arlo — aka the presidential suite. It was stunning. The 1,500-square-foot suite was complete with amenities such as a pool table, record player with vintage vinyl, a pull-out sofa and dining table. There was plenty of space for entertaining. The highlight of the room had to be the sweeping views of the city and mountains. Spanning the entire length of the top floor, the suite offered two wraparound balconies, one in the living room and one in the bedroom. The living room had its own guest bathroom with a shower. A hallway led to the bedroom, which also had its own entrance and a king bed. Like the living room, the bedroom offered panoramic views. It had the same workspace and minibar selections as the standard rooms — again, no coffeemaker or kettle. The bathroom was, well, pretty damn impressive. It featured two vanities and what was probably the largest shower I’ve ever stepped in. At 73 square feet, the shower was big enough to host a party in, if you were so inclined. The shower area led right to the tub. There was a ton of natural light streaming through the balcony window. The closet space was practically identical to that of the standard rooms and included the same green camel. The hotel had two bars and two restaurants, and room service was available from 6:00am to 12:00am. In the lobby was the Window Bar, named after — you guessed it — the expansive windows above it. It was the perfect place to both unwind at the end of a long day and to kickstart a night out. Also on the ground floor was the hotel’s all-day Mediterranean café, Juniper Table. It offered a concise menu of made-to-order items, grab-and-go options and freshly baked pastries. On the top floor was the hotel’s upscale yet laid-back restaurant, 4 Saints, which focused on globally inspired shareable plates with a French influence. It was headed by Chef Stephen Wambach, formerly of the Michelin-starred Restaurant Marc Forgione and the Four Seasons in Chicago. It also had an outdoor dining section, and as the highest restaurant in Palm Springs, its 270-degree valley views didn’t disappoint. On the other end of the building was the hotel’s — and the Coachella Valley’s — only rooftop pool and deck (more on that later). Adjacent to the pool was High Bar, a bar and lounge with a Don Draper-on-vacation vibe, which served drinks and light bites until 10:00pm. As the only rooftop pool in Palm Springs, the Kimpton Rowan’s pool didn’t need much to make it stand out among the city’s ocean of hotel pools. That being said, it was gorgeous — it even made our list of the most Instagrammable places in Palm Springs. With 360-degree views, it was the perfect spot to watch the sunset. There were poolside cabanas, which could be rented out by hotel guests and non-guests for $300 to $1,500 per day, varying by season. They came with pool access for up to six people, two lounge chairs, a couch area, bottled water, a fruit plate, towel service and one complimentary day-parking validation. If you weren’t a hotel guest and wanted to access the pool without shelling out for a cabana rental, you could also purchase a day pass for $30, though access might be restricted, depending on occupancy levels. On the second floor was the 24-hour fitness center. I thought it was good sized for a boutique hotel, and it had a solid range of equipment. I was surprised to find that there was no spa in the hotel, but in-room spa services were offered. Kimpton properties generally don’t have a shortage of amenities, and this hotel was no exception. Complimentary house-car rides were available within three miles of the hotel — which includes the airport — between 7:00am and 11:00pm. And for those who prefer a more eco-friendly way of getting around town, there were also bicycles available to borrow on a first-come, first-served basis. The lobby offered the standard Kimpton complimentary coffee and tea in the mornings and a social hour with complimentary wine, beer and canapés in the evenings. Internet access was included as a part of the resort fee, but the speeds left much to be desired, at 5 Mbps for downloads and just under that for uploads. 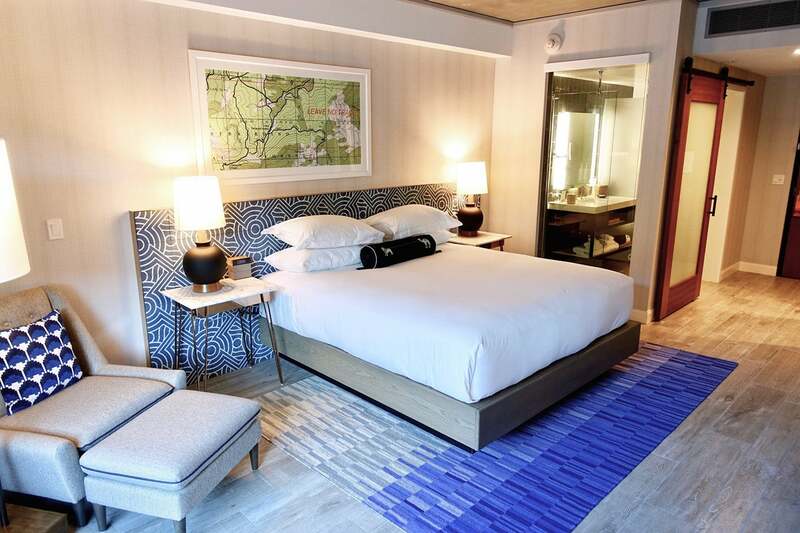 Palm Springs has a major winner on its hands with the opening of the Kimpton Rowan. The hotel boasts a lot of firsts for the city and will definitely be a hit with visitors. Its overall aesthetic far outshines that of neighboring hotels and incorporates a number of thoughtful local touches. With a lack of chic points hotels in the area, the Rowan is a welcome addition for award-travel enthusiasts. All of the excitement surrounding the hotel’s opening was well-warranted, and I already can’t wait to go back for my next desert retreat.